Maxwell Tools Company is a highly acclaimed Manufacturer & Exporter of Scalping Cutters. Made with high quality metals, these Scalping Cutters operates on horizontal or universal milling machines. These cutters can machine large broad surfaces quickly. Our Scalping Cutters are used in slab milling, which may have straight or helical teeth, for producing orthogonal or oblique cutting action. We specialize in manufacturing 2″ dia to 12″ dia & length from 3″ to 25″ in light & heavy duty metals. These cutters are mainly used for scalping copper & brass strips. 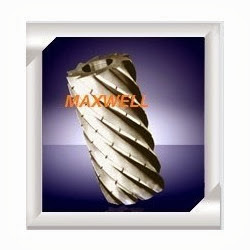 Maxwell Scalping Cutters are used for scalping copper and brassstrips. These Cutters operate on horizontal or universal milling machines to machine large broad surfaces. * Straight teeth producing orthogonal cutting action. * Helical Teeth for oblique cutting action. Slab Milling Cutters/Scalping Cutters are manufactured from 2″ diameter to 12″ diameter & length from 3″ to 25″ in light & heavy duty. Ordering Instruction: OD; Length (OAL); Bore; Helix Angle. 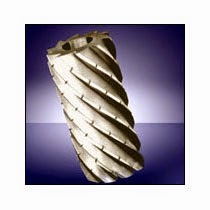 The company is a well-reckoned Milling Cutters Manufacturer and Exporter in India. The Milling Cutters, that we offer, are available in a wide assortment, which is designed as per the set industrial standards. Our assortment of Milling Cutters comprises of Single Angle Cutters, Side & Face Cutters, Shell End Mill Cutters, Concave Cutters, Convex Cutters, and Involute Gear Cutters. Our Milling Cutters are known for their excellent quality and superb efficiency. Our Milling Cutters are available at the most competitive prices.